The Greek Database of Seismogenic Sources is a recently started project devoted to provide Greek authorities of a complete and modern tool for improving the SHA of the country. It also represents an unvaluable source of information for scientists who want to deal with earthquake scenarios and modelling, geodynamics, active deformation and many more. The database is an open-file, continuously updatable, that can accommodate all proposals from multi-field researchers.There are two main developing approaches: the first one is to collect, reprocess, criticize, filter and parameterize all information available in the literature, published or not. During this process, all data will be homogenised and thus, seismogenic sources will be fully comparable. The second approach involves new, original investigations for finding new seismogenic sources or for enriching/verifying already known ones. GreDaSS consists of several layers, both graphical and metadata ones, based on the general structure of the Italian DISS (a special thank to Valensise G. and Basili R. for providing the software and continuous assistance). A brief idea about the DISS concept can be found in Basili et al. (2008). A preliminary, simplified version of the database is soon to be released (http://diss.rm.ingv.it/SHARE), through the European project SHARE (Seismic Hazard Harmonization in Europe). Italy (Istituto Nazionale di Geofisica e Volcanologia). Map of the seismogenic sources (CSSs in orange colour and ISSs in yellow colour) for the broader Aegean Region (Sboras, 2012). A similar map together with the sources and their metadata were also submitted for the EU project SHARE (http://www.share-eu.org/). Sboras S. (2012). The Greek Database of Seismogenic Sources: seismotectonic implications for North Greece, PhD Thesis, University of Ferrara, 252 p.
Caputo R., Chatzipetros A., Pavlides S. and Sboras S. (accepted). 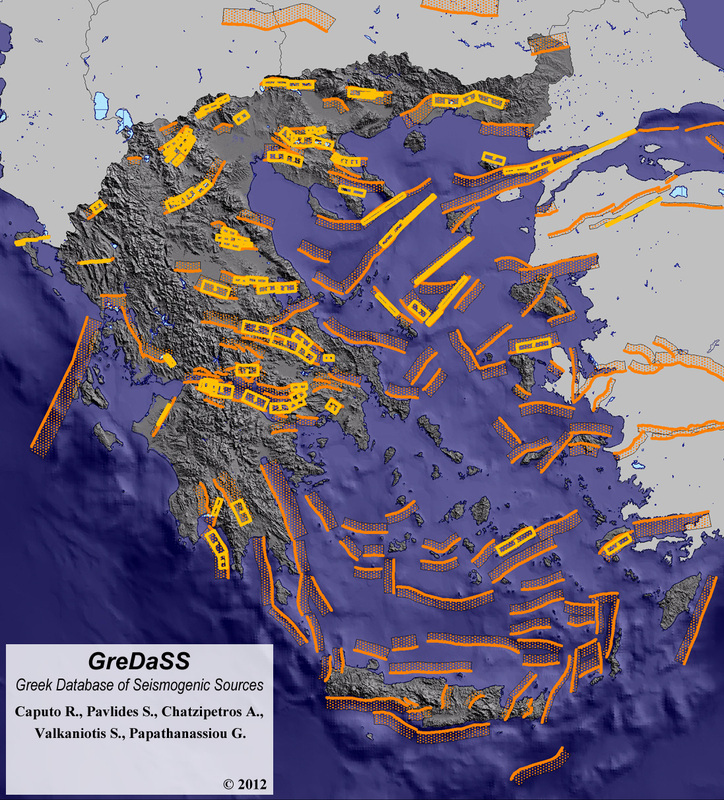 The Greek Database of Seismogenic Sources (GreDaSS): state-of-the-art for northern Greece, Annals of Geophysics, In Press. Sboras S. Pavlides S., Caputo R., Chatzipetros A., Michailidou A., Valkaniotis S. and Papathanasiou G. (2011): Improving the resolution of seismic hazard estimates for critical facilities: the Database of Greek crustal seismogenic sources in the frame of the SHARE project. Proceedings of the 30° Convegno Nazionale GNGTS, 14-17 November, 2011,Trieste, Extended Abstracts, 232-235. Basili R., Garcia Moreno D., Kastelic V., Nemser E., Petricca P., Sboras S. and Valensise G. (2010): Developing seismogenic source models based on geologic fault data in the Euro-Mediterranean area: SHARE mission accomplished? 32nd Assembly of the European Seismological Commission, September 6-10, 2010, Montpellier, France, Abstracts, 86 pp. Sboras S., Caputo R., Pavlides S., Chatzipetros A., Papathanasiou G. and Valkaniotis S. (2009): The Greek Database of Seismogenic sources (GreDaSS): state-of-the-art. Proceedings of the 28° Convegno Nazionale GNGTS, 16-19 November, 2009, Trieste, Extended Abstracts, 126-128.